Searching for creative office space in Santa Monica isn't exactly an easy task! For one, there are so many commercial spaces in Santa Monica and most of them aren't exactly built for creative purposes. Most of the Santa Monica office spaces that you find are more corporate in nature with formal interiors and an uber professional exterior. There is nothing wrong with this, but these cookie cutter office spaces aren't exactly buzzing with creative minds behind their walls! Secondly, searching for creative office space in Santa Monica can be difficult due to the extreme amounts of rent charged for commercial spaces. As with residential, commercial rents can be higher when you are close to the beach. NMS Properties is happy to help you in your search for a creative office space in Santa Monica! NMS Studios one of our commercial spaces and is a fortress, so to speak, for creative minds, industries, businesses and talent. Located close to 20th and Olympic Boulevard, this sprawling Santa Monica creative office compound was built in 1952, originally purposed as a light industrial building. Since then, this collection of several late Bauhaus, mid-century fenestration pattern buildings has changed hands several times, finally resting in the late 2000's with ownership and management by NMS Properties. 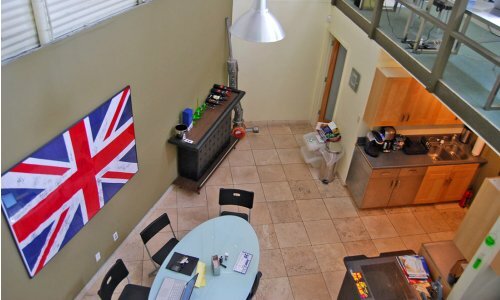 Imagine having a creative space in Santa Monica that is just as unique as you are, regardless of your profession or industry! Open, unique and bohemian, these creative office spaces in Santa Monica are now home to casting offices, writers, artists, post production studios, fashion designers and more! You would be hard pressed to find two of our creative Santa Monica office spaces here that are the same, or even close to the same in appearance. NMS Studios leases creative offices in Santa Monica that are lofts, warehouses, bungalows and studios, some built out by previous tenants and some that are wide open and ready for any tenant improvements that you may visualize to make your space your own creative haven! Picture wooden structures, some with lofts and some without; some free standing bungalows and some structures that house several office spaces. Think of the urban-chic appeal that creative spaces in downtown Los Angeles have, but located much closer to the salty sea breezes of the Pacific Ocean and without the hustle and bustle that downtown Los Angeles sometimes evokes. To be specific, our Santa Monica creative offices have been home to a well known shoe designer and distributor, start up architects, independent interior and fashion designers, film and online video production companies, well known post production teams, a gymnasium, a successful yoga studio, a trapeze classroom, a mom and pop style cafe, and has even served as a filming location on several popular television and online shows. While these creative offices in Santa Monica are located in various single or two-story structures around the property, there is plenty of green space and common areas! Tenants network and create tightly knit bonds and socialize in the common area kitchen and game room, at the onsite Cafe and in the common area all purpose area. Visitors to NMS Studios remark that this Santa Monica creative office space is unlike anything else they have seen on the westside. Tenants say that at times they feel more relaxed "at work" then when they are at home! So if you're looking for a laid back atmosphere where creative juices can flow and inspiration is ever present, check out NMS Studios by contacting the leasing and management office to find out what is available at (310) 453-5046. Be sure to ask about shorter term leases if you so desire.